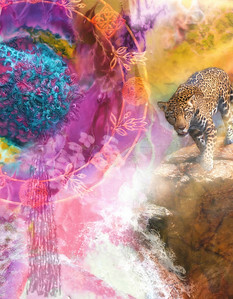 BIG CATS ARTWORK of the world, Tigers, Lions, Leopards, Cheetahs, and endangered species from all continents. 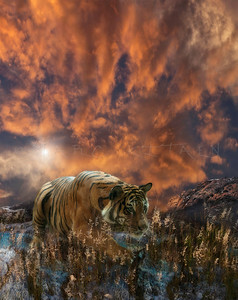 TIGERS NEED WILD PEACE In untraveled environments known only in our dreams, a fond wish I breath. May those places stay free of our foot prints and trespasses, so the creatures of earth can truly live in their "Wild Peace". Malayan Tiger. There are currently six subspecies of tigers, each living in different habitats: flooded mangrove forests, arid forests, tropical forests, and taiga. The different subspecies are found in small areas of Asia, India, and Russia. The largest subspecies lives in snowy areas of Russia. The smallest and darkest subspecies is found farther south, in the jungles of Indonesia. Female tigers are always smaller than males. The tiger (Panthera tigris) is the largest cat species, most recognizable for their pattern of dark vertical stripes on reddish-orange fur with a lighter underside. The species is classified in the genus Panthera with the lion, leopard, jaguar and snow leopard. Tigers are apex predators, primarily preying on ungulates such as deer and bovids. They are territorial and generally solitary but social animals, often requiring large contiguous areas of habitat that support their prey requirements. This, coupled with the fact that they are indigenous to some of the more densely populated places on Earth, has caused significant conflicts with humans. The tiger is the largest cat species, most recognizable for their pattern of dark vertical stripes on reddish-orange fur with a lighter underside. Tigers once ranged widely across Asia, from Turkey in the west to the eastern coast of Russia. Over the past 100 years, they have lost 93% of their historic range, and have been extirpated from southwest and central Asia, from the islands of Java and Bali, and from large areas of Southeast and Eastern Asia. Today, they range from the Siberian taiga to open grasslands and tropical mangrove swamps. The remaining six tiger subspecies have been classified as endangered by IUCN. The global population in the wild is estimated to number between 3,062 and 3,948 individuals, down from around 100,000 at the start of the 20th century, with most remaining populations occurring in small pockets isolated from each other, of which about 2,000 exist on the Indian subcontinent. Bengal tiger: Lives in India, Nepal, Bhutan, and Bangladesh, and is the most common subspecies. In 2011, the total adult population was estimated at 1,520–1,909 in India, 440 in Bangladesh, 155 in Nepal and 75 in Bhutan. In 2014, the population in India was estimated at 2,226,163–253 in Nepal and 103 in Bhutan as of 2015. It lives in alluvial grasslands, subtropical and tropical rainforests, scrub forests, wet and dry deciduous forests, and mangroves. 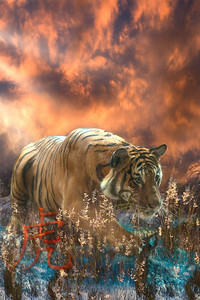 Indochinese tiger: Is found in Cambodia, China, Laos, Burma, Thailand, and Vietnam. In 2010 the total population was estimated at about 350 individuals. 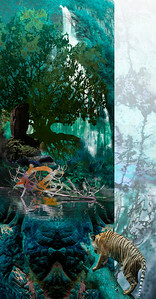 Their preferred habitat is forests in mountainous or hilly regions. Malayan tiger: Exclusively found in the southern part of the Malay Peninsula. The last native wild tiger in Singapore was shot dead in 1930. Siberian tiger: Inhabits the Amur-Ussuri region of Primorsky Krai and Khabarovsk Krai in far eastern Siberia, with the exception of a small population in Hunchun National Siberian Tiger Nature Reserve in northeastern China, near the border of North Korea. In 2005, there were 331–393 adult and subadult Siberian tigers in the region, with a breeding adult population of about 250 individuals. As of 2015, there an estimated population of 480-540 individuals in the Russian Far East. South China tiger: Is the most critically endangered subspecies of tiger, and one of the 10 most endangered animals in the world. The South China tiger is considered to be the most ancient of the tiger subspecies and is distinguished by a particularly narrow skull, long muzzle nose, rhombus-like stripes and vivid orange colour. Sumatran tiger: Found only on the island of Sumatra, and is thus the last surviving of the three Indonesian island subspecies. Listed as a distinct subspecies as of 1998, when genetic testing revealed the presence of unique genetic markers, and is critically endangered. LIGHT OF THE TIGER MALAYAN TIGER. There are currently six subspecies of tigers, each living in different habitats: flooded mangrove forests, arid forests, tropical forests, and taiga. The different subspecies are found in small areas of Asia, India, and Russia. The largest subspecies lives in snowy areas of Russia. The smallest and darkest subspecies is found farther south, in the jungles of Indonesia. Female tigers are always smaller than males. The tiger (Panthera tigris) is the largest cat species, most recognizable for their pattern of dark vertical stripes on reddish-orange fur with a lighter underside. The species is classified in the genus Panthera with the lion, leopard, jaguar and snow leopard. Tigers are apex predators, primarily preying on ungulates such as deer and bovids. They are territorial and generally solitary but social animals, often requiring large contiguous areas of habitat that support their prey requirements. This, coupled with the fact that they are indigenous to some of the more densely populated places on Earth, has caused significant conflicts with humans. The tiger is the largest cat species, most recognizable for their pattern of dark vertical stripes on reddish-orange fur with a lighter underside. Tigers once ranged widely across Asia, from Turkey in the west to the eastern coast of Russia. Over the past 100 years, they have lost 93% of their historic range, and have been extirpated from southwest and central Asia, from the islands of Java and Bali, and from large areas of Southeast and Eastern Asia. Today, they range from the Siberian taiga to open grasslands and tropical mangrove swamps. The remaining six tiger subspecies have been classified as endangered by IUCN. The global population in the wild is estimated to number between 3,062 and 3,948 individuals, down from around 100,000 at the start of the 20th century, with most remaining populations occurring in small pockets isolated from each other, of which about 2,000 exist on the Indian subcontinent. Bengal tiger: Lives in India, Nepal, Bhutan, and Bangladesh, and is the most common subspecies. In 2011, the total adult population was estimated at 1,520–1,909 in India, 440 in Bangladesh, 155 in Nepal and 75 in Bhutan. In 2014, the population in India was estimated at 2,226,163–253 in Nepal and 103 in Bhutan as of 2015. It lives in alluvial grasslands, subtropical and tropical rainforests, scrub forests, wet and dry deciduous forests, and mangroves. Indochinese tiger: Is found in Cambodia, China, Laos, Burma, Thailand, and Vietnam. In 2010 the total population was estimated at about 350 individuals. Their preferred habitat is forests in mountainous or hilly regions. Malayan tiger: Exclusively found in the southern part of the Malay Peninsula. The last native wild tiger in Singapore was shot dead in 1930. Siberian tiger: Inhabits the Amur-Ussuri region of Primorsky Krai and Khabarovsk Krai in far eastern Siberia, with the exception of a small population in Hunchun National Siberian Tiger Nature Reserve in northeastern China, near the border of North Korea. In 2005, there were 331–393 adult and subadult Siberian tigers in the region, with a breeding adult population of about 250 individuals. As of 2015, there an estimated population of 480-540 individuals in the Russian Far East. South China tiger: Is the most critically endangered subspecies of tiger, and one of the 10 most endangered animals in the world. The South China tiger is considered to be the most ancient of the tiger subspecies and is distinguished by a particularly narrow skull, long muzzle nose, rhombus-like stripes and vivid orange colour. Sumatran tiger: Found only on the island of Sumatra, and is thus the last surviving of the three Indonesian island subspecies. Listed as a distinct subspecies as of 1998, when genetic testing revealed the presence of unique genetic markers, and is critically endangered. 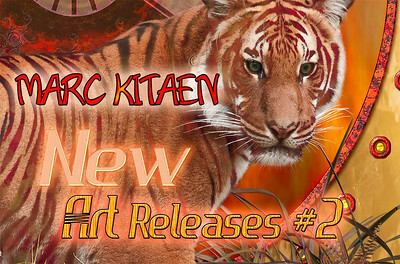 "6th Sense of the Tiger"
"6th Sense of the Tiger" Malayan Tiger portrait. TIGER SKYFALLS (Malayan Tiger) There are currently six subspecies of tigers, each living in different habitats: flooded mangrove forests, arid forests, tropical forests, and taiga. The different subspecies are found in small areas of Asia, India, and Russia. The largest subspecies lives in snowy areas of Russia. The smallest and darkest subspecies is found farther south, in the jungles of Indonesia. Female tigers are always smaller than males. The tiger (Panthera tigris) is the largest cat species, most recognizable for their pattern of dark vertical stripes on reddish-orange fur with a lighter underside. The species is classified in the genus Panthera with the lion, leopard, jaguar and snow leopard. Tigers are apex predators, primarily preying on ungulates such as deer and bovids. They are territorial and generally solitary but social animals, often requiring large contiguous areas of habitat that support their prey requirements. This, coupled with the fact that they are indigenous to some of the more densely populated places on Earth, has caused significant conflicts with humans. The tiger is the largest cat species, most recognizable for their pattern of dark vertical stripes on reddish-orange fur with a lighter underside. Tigers once ranged widely across Asia, from Turkey in the west to the eastern coast of Russia. Over the past 100 years, they have lost 93% of their historic range, and have been extirpated from southwest and central Asia, from the islands of Java and Bali, and from large areas of Southeast and Eastern Asia. Today, they range from the Siberian taiga to open grasslands and tropical mangrove swamps. The remaining six tiger subspecies have been classified as endangered by IUCN. The global population in the wild is estimated to number between 3,062 and 3,948 individuals, down from around 100,000 at the start of the 20th century, with most remaining populations occurring in small pockets isolated from each other, of which about 2,000 exist on the Indian subcontinent. Bengal tiger: Lives in India, Nepal, Bhutan, and Bangladesh, and is the most common subspecies. In 2011, the total adult population was estimated at 1,520–1,909 in India, 440 in Bangladesh, 155 in Nepal and 75 in Bhutan. In 2014, the population in India was estimated at 2,226,163–253 in Nepal and 103 in Bhutan as of 2015. It lives in alluvial grasslands, subtropical and tropical rainforests, scrub forests, wet and dry deciduous forests, and mangroves. Indochinese tiger: Is found in Cambodia, China, Laos, Burma, Thailand, and Vietnam. In 2010 the total population was estimated at about 350 individuals. Their preferred habitat is forests in mountainous or hilly regions. Malayan tiger: Exclusively found in the southern part of the Malay Peninsula. The last native wild tiger in Singapore was shot dead in 1930. Siberian tiger: Inhabits the Amur-Ussuri region of Primorsky Krai and Khabarovsk Krai in far eastern Siberia, with the exception of a small population in Hunchun National Siberian Tiger Nature Reserve in northeastern China, near the border of North Korea. In 2005, there were 331–393 adult and subadult Siberian tigers in the region, with a breeding adult population of about 250 individuals. As of 2015, there an estimated population of 480-540 individuals in the Russian Far East. South China tiger: Is the most critically endangered subspecies of tiger, and one of the 10 most endangered animals in the world. The South China tiger is considered to be the most ancient of the tiger subspecies and is distinguished by a particularly narrow skull, long muzzle nose, rhombus-like stripes and vivid orange colour. Sumatran tiger: Found only on the island of Sumatra, and is thus the last surviving of the three Indonesian island subspecies. Listed as a distinct subspecies as of 1998, when genetic testing revealed the presence of unique genetic markers, and is critically endangered. EYE SEE YOU TIGER (Malayan Tiger) There are currently six subspecies of tigers, each living in different habitats: flooded mangrove forests, arid forests, tropical forests, and taiga. The different subspecies are found in small areas of Asia, India, and Russia. The largest subspecies lives in snowy areas of Russia. The smallest and darkest subspecies is found farther south, in the jungles of Indonesia. Female tigers are always smaller than males. The tiger (Panthera tigris) is the largest cat species, most recognizable for their pattern of dark vertical stripes on reddish-orange fur with a lighter underside. The species is classified in the genus Panthera with the lion, leopard, jaguar and snow leopard. Tigers are apex predators, primarily preying on ungulates such as deer and bovids. They are territorial and generally solitary but social animals, often requiring large contiguous areas of habitat that support their prey requirements. This, coupled with the fact that they are indigenous to some of the more densely populated places on Earth, has caused significant conflicts with humans. The tiger is the largest cat species, most recognizable for their pattern of dark vertical stripes on reddish-orange fur with a lighter underside. Tigers once ranged widely across Asia, from Turkey in the west to the eastern coast of Russia. Over the past 100 years, they have lost 93% of their historic range, and have been extirpated from southwest and central Asia, from the islands of Java and Bali, and from large areas of Southeast and Eastern Asia. Today, they range from the Siberian taiga to open grasslands and tropical mangrove swamps. The remaining six tiger subspecies have been classified as endangered by IUCN. The global population in the wild is estimated to number between 3,062 and 3,948 individuals, down from around 100,000 at the start of the 20th century, with most remaining populations occurring in small pockets isolated from each other, of which about 2,000 exist on the Indian subcontinent. Bengal tiger: Lives in India, Nepal, Bhutan, and Bangladesh, and is the most common subspecies. In 2011, the total adult population was estimated at 1,520–1,909 in India, 440 in Bangladesh, 155 in Nepal and 75 in Bhutan. In 2014, the population in India was estimated at 2,226,163–253 in Nepal and 103 in Bhutan as of 2015. It lives in alluvial grasslands, subtropical and tropical rainforests, scrub forests, wet and dry deciduous forests, and mangroves. Indochinese tiger: Is found in Cambodia, China, Laos, Burma, Thailand, and Vietnam. In 2010 the total population was estimated at about 350 individuals. Their preferred habitat is forests in mountainous or hilly regions. Malayan tiger: Exclusively found in the southern part of the Malay Peninsula. The last native wild tiger in Singapore was shot dead in 1930. Siberian tiger: Inhabits the Amur-Ussuri region of Primorsky Krai and Khabarovsk Krai in far eastern Siberia, with the exception of a small population in Hunchun National Siberian Tiger Nature Reserve in northeastern China, near the border of North Korea. In 2005, there were 331–393 adult and subadult Siberian tigers in the region, with a breeding adult population of about 250 individuals. As of 2015, there an estimated population of 480-540 individuals in the Russian Far East. South China tiger: Is the most critically endangered subspecies of tiger, and one of the 10 most endangered animals in the world. The South China tiger is considered to be the most ancient of the tiger subspecies and is distinguished by a particularly narrow skull, long muzzle nose, rhombus-like stripes and vivid orange colour. Sumatran tiger: Found only on the island of Sumatra, and is thus the last surviving of the three Indonesian island subspecies. Listed as a distinct subspecies as of 1998, when genetic testing revealed the presence of unique genetic markers, and is critically endangered. TIGER HAVEN MALAYAN TIGER. There are currently six subspecies of tigers, each living in different habitats: flooded mangrove forests, arid forests, tropical forests, and taiga. The different subspecies are found in small areas of Asia, India, and Russia. The largest subspecies lives in snowy areas of Russia. The smallest and darkest subspecies is found farther south, in the jungles of Indonesia. Female tigers are always smaller than males. The tiger (Panthera tigris) is the largest cat species, most recognizable for their pattern of dark vertical stripes on reddish-orange fur with a lighter underside. The species is classified in the genus Panthera with the lion, leopard, jaguar and snow leopard. Tigers are apex predators, primarily preying on ungulates such as deer and bovids. They are territorial and generally solitary but social animals, often requiring large contiguous areas of habitat that support their prey requirements. This, coupled with the fact that they are indigenous to some of the more densely populated places on Earth, has caused significant conflicts with humans. The tiger is the largest cat species, most recognizable for their pattern of dark vertical stripes on reddish-orange fur with a lighter underside. Tigers once ranged widely across Asia, from Turkey in the west to the eastern coast of Russia. Over the past 100 years, they have lost 93% of their historic range, and have been extirpated from southwest and central Asia, from the islands of Java and Bali, and from large areas of Southeast and Eastern Asia. Today, they range from the Siberian taiga to open grasslands and tropical mangrove swamps. The remaining six tiger subspecies have been classified as endangered by IUCN. The global population in the wild is estimated to number between 3,062 and 3,948 individuals, down from around 100,000 at the start of the 20th century, with most remaining populations occurring in small pockets isolated from each other, of which about 2,000 exist on the Indian subcontinent. Bengal tiger: Lives in India, Nepal, Bhutan, and Bangladesh, and is the most common subspecies. In 2011, the total adult population was estimated at 1,520–1,909 in India, 440 in Bangladesh, 155 in Nepal and 75 in Bhutan. In 2014, the population in India was estimated at 2,226,163–253 in Nepal and 103 in Bhutan as of 2015. It lives in alluvial grasslands, subtropical and tropical rainforests, scrub forests, wet and dry deciduous forests, and mangroves. Indochinese tiger: Is found in Cambodia, China, Laos, Burma, Thailand, and Vietnam. In 2010 the total population was estimated at about 350 individuals. Their preferred habitat is forests in mountainous or hilly regions. Malayan tiger: Exclusively found in the southern part of the Malay Peninsula. The last native wild tiger in Singapore was shot dead in 1930. Siberian tiger: Inhabits the Amur-Ussuri region of Primorsky Krai and Khabarovsk Krai in far eastern Siberia, with the exception of a small population in Hunchun National Siberian Tiger Nature Reserve in northeastern China, near the border of North Korea. In 2005, there were 331–393 adult and subadult Siberian tigers in the region, with a breeding adult population of about 250 individuals. As of 2015, there an estimated population of 480-540 individuals in the Russian Far East. South China tiger: Is the most critically endangered subspecies of tiger, and one of the 10 most endangered animals in the world. The South China tiger is considered to be the most ancient of the tiger subspecies and is distinguished by a particularly narrow skull, long muzzle nose, rhombus-like stripes and vivid orange colour. Sumatran tiger: Found only on the island of Sumatra, and is thus the last surviving of the three Indonesian island subspecies. Listed as a distinct subspecies as of 1998, when genetic testing revealed the presence of unique genetic markers, and is critically endangered. TIGER HAVEN (vertical version) MALAYAN TIGER. There are currently six subspecies of tigers, each living in different habitats: flooded mangrove forests, arid forests, tropical forests, and taiga. The different subspecies are found in small areas of Asia, India, and Russia. The largest subspecies lives in snowy areas of Russia. The smallest and darkest subspecies is found farther south, in the jungles of Indonesia. Female tigers are always smaller than males. The tiger (Panthera tigris) is the largest cat species, most recognizable for their pattern of dark vertical stripes on reddish-orange fur with a lighter underside. The species is classified in the genus Panthera with the lion, leopard, jaguar and snow leopard. Tigers are apex predators, primarily preying on ungulates such as deer and bovids. They are territorial and generally solitary but social animals, often requiring large contiguous areas of habitat that support their prey requirements. This, coupled with the fact that they are indigenous to some of the more densely populated places on Earth, has caused significant conflicts with humans. The tiger is the largest cat species, most recognizable for their pattern of dark vertical stripes on reddish-orange fur with a lighter underside. Tigers once ranged widely across Asia, from Turkey in the west to the eastern coast of Russia. Over the past 100 years, they have lost 93% of their historic range, and have been extirpated from southwest and central Asia, from the islands of Java and Bali, and from large areas of Southeast and Eastern Asia. Today, they range from the Siberian taiga to open grasslands and tropical mangrove swamps. The remaining six tiger subspecies have been classified as endangered by IUCN. The global population in the wild is estimated to number between 3,062 and 3,948 individuals, down from around 100,000 at the start of the 20th century, with most remaining populations occurring in small pockets isolated from each other, of which about 2,000 exist on the Indian subcontinent. Bengal tiger: Lives in India, Nepal, Bhutan, and Bangladesh, and is the most common subspecies. In 2011, the total adult population was estimated at 1,520–1,909 in India, 440 in Bangladesh, 155 in Nepal and 75 in Bhutan. In 2014, the population in India was estimated at 2,226,163–253 in Nepal and 103 in Bhutan as of 2015. It lives in alluvial grasslands, subtropical and tropical rainforests, scrub forests, wet and dry deciduous forests, and mangroves. Indochinese tiger: Is found in Cambodia, China, Laos, Burma, Thailand, and Vietnam. In 2010 the total population was estimated at about 350 individuals. Their preferred habitat is forests in mountainous or hilly regions. Malayan tiger: Exclusively found in the southern part of the Malay Peninsula. The last native wild tiger in Singapore was shot dead in 1930. Siberian tiger: Inhabits the Amur-Ussuri region of Primorsky Krai and Khabarovsk Krai in far eastern Siberia, with the exception of a small population in Hunchun National Siberian Tiger Nature Reserve in northeastern China, near the border of North Korea. In 2005, there were 331–393 adult and subadult Siberian tigers in the region, with a breeding adult population of about 250 individuals. As of 2015, there an estimated population of 480-540 individuals in the Russian Far East. South China tiger: Is the most critically endangered subspecies of tiger, and one of the 10 most endangered animals in the world. The South China tiger is considered to be the most ancient of the tiger subspecies and is distinguished by a particularly narrow skull, long muzzle nose, rhombus-like stripes and vivid orange colour. Sumatran tiger: Found only on the island of Sumatra, and is thus the last surviving of the three Indonesian island subspecies. Listed as a distinct subspecies as of 1998, when genetic testing revealed the presence of unique genetic markers, and is critically endangered. THE ENCHANTED TIGER Malayan Tiger. There are currently six subspecies of tigers, each living in different habitats: flooded mangrove forests, arid forests, tropical forests, and taiga. The different subspecies are found in small areas of Asia, India, and Russia. The largest subspecies lives in snowy areas of Russia. The smallest and darkest subspecies is found farther south, in the jungles of Indonesia. Female tigers are always smaller than males. The tiger (Panthera tigris) is the largest cat species, most recognizable for their pattern of dark vertical stripes on reddish-orange fur with a lighter underside. The species is classified in the genus Panthera with the lion, leopard, jaguar and snow leopard. Tigers are apex predators, primarily preying on ungulates such as deer and bovids. They are territorial and generally solitary but social animals, often requiring large contiguous areas of habitat that support their prey requirements. This, coupled with the fact that they are indigenous to some of the more densely populated places on Earth, has caused significant conflicts with humans. The tiger is the largest cat species, most recognizable for their pattern of dark vertical stripes on reddish-orange fur with a lighter underside. Tigers once ranged widely across Asia, from Turkey in the west to the eastern coast of Russia. Over the past 100 years, they have lost 93% of their historic range, and have been extirpated from southwest and central Asia, from the islands of Java and Bali, and from large areas of Southeast and Eastern Asia. Today, they range from the Siberian taiga to open grasslands and tropical mangrove swamps. The remaining six tiger subspecies have been classified as endangered by IUCN. The global population in the wild is estimated to number between 3,062 and 3,948 individuals, down from around 100,000 at the start of the 20th century, with most remaining populations occurring in small pockets isolated from each other, of which about 2,000 exist on the Indian subcontinent. Bengal tiger: Lives in India, Nepal, Bhutan, and Bangladesh, and is the most common subspecies. In 2011, the total adult population was estimated at 1,520–1,909 in India, 440 in Bangladesh, 155 in Nepal and 75 in Bhutan. In 2014, the population in India was estimated at 2,226,163–253 in Nepal and 103 in Bhutan as of 2015. It lives in alluvial grasslands, subtropical and tropical rainforests, scrub forests, wet and dry deciduous forests, and mangroves. Indochinese tiger: Is found in Cambodia, China, Laos, Burma, Thailand, and Vietnam. In 2010 the total population was estimated at about 350 individuals. Their preferred habitat is forests in mountainous or hilly regions. Malayan tiger: Exclusively found in the southern part of the Malay Peninsula. 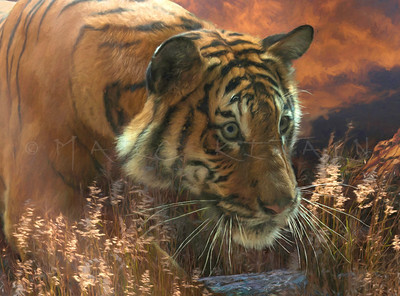 The last native wild tiger in Singapore was shot dead in 1930. Siberian tiger: Inhabits the Amur-Ussuri region of Primorsky Krai and Khabarovsk Krai in far eastern Siberia, with the exception of a small population in Hunchun National Siberian Tiger Nature Reserve in northeastern China, near the border of North Korea. In 2005, there were 331–393 adult and subadult Siberian tigers in the region, with a breeding adult population of about 250 individuals. As of 2015, there an estimated population of 480-540 individuals in the Russian Far East. South China tiger: Is the most critically endangered subspecies of tiger, and one of the 10 most endangered animals in the world. The South China tiger is considered to be the most ancient of the tiger subspecies and is distinguished by a particularly narrow skull, long muzzle nose, rhombus-like stripes and vivid orange colour. Sumatran tiger: Found only on the island of Sumatra, and is thus the last surviving of the three Indonesian island subspecies. Listed as a distinct subspecies as of 1998, when genetic testing revealed the presence of unique genetic markers, and is critically endangered. "TIGER BATH TIME" (Sumatran Tiger) Sumatran tiger: Found only on the island of Sumatra, and is thus the last surviving of the three Indonesian island subspecies. Listed as a distinct subspecies as of 1998, when genetic testing revealed the presence of unique genetic markers, and is critically endangered. There are currently six subspecies of tigers, each living in different habitats: flooded mangrove forests, arid forests, tropical forests, and taiga. The different subspecies are found in small areas of Asia, India, and Russia. The largest subspecies lives in snowy areas of Russia. The smallest and darkest subspecies is found farther south, in the jungles of Indonesia. Female tigers are always smaller than males. The tiger (Panthera tigris) is the largest cat species, most recognizable for their pattern of dark vertical stripes on reddish-orange fur with a lighter underside. The species is classified in the genus Panthera with the lion, leopard, jaguar and snow leopard. Tigers are apex predators, primarily preying on ungulates such as deer and bovids. They are territorial and generally solitary but social animals, often requiring large contiguous areas of habitat that support their prey requirements. This, coupled with the fact that they are indigenous to some of the more densely populated places on Earth, has caused significant conflicts with humans. The tiger is the largest cat species, most recognizable for their pattern of dark vertical stripes on reddish-orange fur with a lighter underside. Tigers once ranged widely across Asia, from Turkey in the west to the eastern coast of Russia. Over the past 100 years, they have lost 93% of their historic range, and have been extirpated from southwest and central Asia, from the islands of Java and Bali, and from large areas of Southeast and Eastern Asia. Today, they range from the Siberian taiga to open grasslands and tropical mangrove swamps. The remaining six tiger subspecies have been classified as endangered by IUCN. The global population in the wild is estimated to number between 3,062 and 3,948 individuals, down from around 100,000 at the start of the 20th century, with most remaining populations occurring in small pockets isolated from each other, of which about 2,000 exist on the Indian subcontinent. "Tiger Reflections" (Sumatran tiger) Sumatran tiger: Found only on the island of Sumatra, and is thus the last surviving of the three Indonesian island subspecies. Listed as a distinct subspecies as of 1998, when genetic testing revealed the presence of unique genetic markers, and is critically endangered. There are currently six subspecies of tigers, each living in different habitats: flooded mangrove forests, arid forests, tropical forests, and taiga. The different subspecies are found in small areas of Asia, India, and Russia. The largest subspecies lives in snowy areas of Russia. The smallest and darkest subspecies is found farther south, in the jungles of Indonesia. Female tigers are always smaller than males. The tiger (Panthera tigris) is the largest cat species, most recognizable for their pattern of dark vertical stripes on reddish-orange fur with a lighter underside. The species is classified in the genus Panthera with the lion, leopard, jaguar and snow leopard. Tigers are apex predators, primarily preying on ungulates such as deer and bovids. They are territorial and generally solitary but social animals, often requiring large contiguous areas of habitat that support their prey requirements. This, coupled with the fact that they are indigenous to some of the more densely populated places on Earth, has caused significant conflicts with humans. The tiger is the largest cat species, most recognizable for their pattern of dark vertical stripes on reddish-orange fur with a lighter underside. Tigers once ranged widely across Asia, from Turkey in the west to the eastern coast of Russia. Over the past 100 years, they have lost 93% of their historic range, and have been extirpated from southwest and central Asia, from the islands of Java and Bali, and from large areas of Southeast and Eastern Asia. Today, they range from the Siberian taiga to open grasslands and tropical mangrove swamps. The remaining six tiger subspecies have been classified as endangered by IUCN. The global population in the wild is estimated to number between 3,062 and 3,948 individuals, down from around 100,000 at the start of the 20th century, with most remaining populations occurring in small pockets isolated from each other, of which about 2,000 exist on the Indian subcontinent. YOUTH OF THE NATION SUMATRAN TIGER There are currently six subspecies of tigers, each living in different habitats: flooded mangrove forests, arid forests, tropical forests, and taiga. The different subspecies are found in small areas of Asia, India, and Russia. The largest subspecies lives in snowy areas of Russia. The smallest and darkest subspecies is found farther south, in the jungles of Indonesia. Female tigers are always smaller than males. The tiger (Panthera tigris) is the largest cat species, most recognizable for their pattern of dark vertical stripes on reddish-orange fur with a lighter underside. The species is classified in the genus Panthera with the lion, leopard, jaguar and snow leopard. Tigers are apex predators, primarily preying on ungulates such as deer and bovids. They are territorial and generally solitary but social animals, often requiring large contiguous areas of habitat that support their prey requirements. This, coupled with the fact that they are indigenous to some of the more densely populated places on Earth, has caused significant conflicts with humans. The tiger is the largest cat species, most recognizable for their pattern of dark vertical stripes on reddish-orange fur with a lighter underside. Tigers once ranged widely across Asia, from Turkey in the west to the eastern coast of Russia. Over the past 100 years, they have lost 93% of their historic range, and have been extirpated from southwest and central Asia, from the islands of Java and Bali, and from large areas of Southeast and Eastern Asia. Today, they range from the Siberian taiga to open grasslands and tropical mangrove swamps. The remaining six tiger subspecies have been classified as endangered by IUCN. The global population in the wild is estimated to number between 3,062 and 3,948 individuals, down from around 100,000 at the start of the 20th century, with most remaining populations occurring in small pockets isolated from each other, of which about 2,000 exist on the Indian subcontinent. Bengal tiger: Lives in India, Nepal, Bhutan, and Bangladesh, and is the most common subspecies. In 2011, the total adult population was estimated at 1,520–1,909 in India, 440 in Bangladesh, 155 in Nepal and 75 in Bhutan. In 2014, the population in India was estimated at 2,226,163–253 in Nepal and 103 in Bhutan as of 2015. It lives in alluvial grasslands, subtropical and tropical rainforests, scrub forests, wet and dry deciduous forests, and mangroves. Indochinese tiger: Is found in Cambodia, China, Laos, Burma, Thailand, and Vietnam. In 2010 the total population was estimated at about 350 individuals. Their preferred habitat is forests in mountainous or hilly regions. Malayan tiger: Exclusively found in the southern part of the Malay Peninsula. The last native wild tiger in Singapore was shot dead in 1930. Siberian tiger: Inhabits the Amur-Ussuri region of Primorsky Krai and Khabarovsk Krai in far eastern Siberia, with the exception of a small population in Hunchun National Siberian Tiger Nature Reserve in northeastern China, near the border of North Korea. In 2005, there were 331–393 adult and subadult Siberian tigers in the region, with a breeding adult population of about 250 individuals. As of 2015, there an estimated population of 480-540 individuals in the Russian Far East. South China tiger: Is the most critically endangered subspecies of tiger, and one of the 10 most endangered animals in the world. The South China tiger is considered to be the most ancient of the tiger subspecies and is distinguished by a particularly narrow skull, long muzzle nose, rhombus-like stripes and vivid orange colour. Sumatran tiger: Found only on the island of Sumatra, and is thus the last surviving of the three Indonesian island subspecies. Listed as a distinct subspecies as of 1998, when genetic testing revealed the presence of unique genetic markers, and is critically endangered. 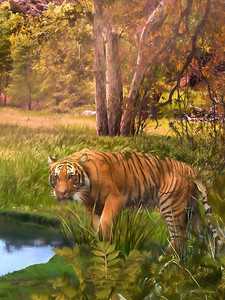 POND OF SOLACE TIGER There are currently six subspecies of tigers, each living in different habitats: flooded mangrove forests, arid forests, tropical forests, and taiga. The different subspecies are found in small areas of Asia, India, and Russia. The largest subspecies lives in snowy areas of Russia. The smallest and darkest subspecies is found farther south, in the jungles of Indonesia. Female tigers are always smaller than males. The tiger (Panthera tigris) is the largest cat species, most recognizable for their pattern of dark vertical stripes on reddish-orange fur with a lighter underside. The species is classified in the genus Panthera with the lion, leopard, jaguar and snow leopard. Tigers are apex predators, primarily preying on ungulates such as deer and bovids. They are territorial and generally solitary but social animals, often requiring large contiguous areas of habitat that support their prey requirements. This, coupled with the fact that they are indigenous to some of the more densely populated places on Earth, has caused significant conflicts with humans. The tiger is the largest cat species, most recognizable for their pattern of dark vertical stripes on reddish-orange fur with a lighter underside. Tigers once ranged widely across Asia, from Turkey in the west to the eastern coast of Russia. Over the past 100 years, they have lost 93% of their historic range, and have been extirpated from southwest and central Asia, from the islands of Java and Bali, and from large areas of Southeast and Eastern Asia. Today, they range from the Siberian taiga to open grasslands and tropical mangrove swamps. The remaining six tiger subspecies have been classified as endangered by IUCN. The global population in the wild is estimated to number between 3,062 and 3,948 individuals, down from around 100,000 at the start of the 20th century, with most remaining populations occurring in small pockets isolated from each other, of which about 2,000 exist on the Indian subcontinent. Bengal tiger: Lives in India, Nepal, Bhutan, and Bangladesh, and is the most common subspecies. In 2011, the total adult population was estimated at 1,520–1,909 in India, 440 in Bangladesh, 155 in Nepal and 75 in Bhutan. In 2014, the population in India was estimated at 2,226,163–253 in Nepal and 103 in Bhutan as of 2015. It lives in alluvial grasslands, subtropical and tropical rainforests, scrub forests, wet and dry deciduous forests, and mangroves. Indochinese tiger: Is found in Cambodia, China, Laos, Burma, Thailand, and Vietnam. In 2010 the total population was estimated at about 350 individuals. Their preferred habitat is forests in mountainous or hilly regions. Malayan tiger: Exclusively found in the southern part of the Malay Peninsula. The last native wild tiger in Singapore was shot dead in 1930. Siberian tiger: Inhabits the Amur-Ussuri region of Primorsky Krai and Khabarovsk Krai in far eastern Siberia, with the exception of a small population in Hunchun National Siberian Tiger Nature Reserve in northeastern China, near the border of North Korea. In 2005, there were 331–393 adult and subadult Siberian tigers in the region, with a breeding adult population of about 250 individuals. As of 2015, there an estimated population of 480-540 individuals in the Russian Far East. South China tiger: Is the most critically endangered subspecies of tiger, and one of the 10 most endangered animals in the world. The South China tiger is considered to be the most ancient of the tiger subspecies and is distinguished by a particularly narrow skull, long muzzle nose, rhombus-like stripes and vivid orange colour. Sumatran tiger: Found only on the island of Sumatra, and is thus the last surviving of the three Indonesian island subspecies. Listed as a distinct subspecies as of 1998, when genetic testing revealed the presence of unique genetic markers, and is critically endangered. LEOPARD LAGOON (original) The leopard (Panthera padres), is one of the five "big cats" in the genus Panthera. It is a member of the family Felidae, with a wide range in sub-Saharan Africa and parts of Asia. Compared to other members of Felidae, the leopard has relatively short legs and a long body with a large skull. It is similar in appearance to the jaguar, but has a smaller, lighter physique. 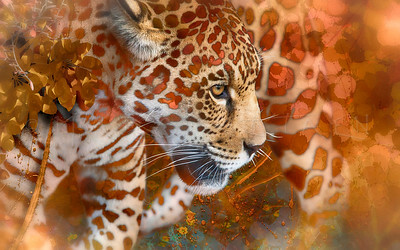 Its fur is marked with rosettes similar to those of the jaguar, but the leopard's rosettes are smaller and more densely packed, and do not usually have central spots as the jaguar's do. Both leopards and jaguars that are melanistic are known as black panthers. The leopard is distinguished by its well-camouflaged fur, opportunistic hunting behaviour, broad diet, and strength (which it uses to move heavy carcasses into trees), as well as its ability to adapt to various habitats ranging from rainforest to steppe, including arid and montane areas, and its ability to run at speeds of up to 58 kilometres per hour (36 mph) The leopard is a big cat distinguished by its robust build and muscular but relatively shorter limbs, a broad head and a coat covered by spots arranged in rosettes. Males stand 60–70 cm (24–28 in) at the shoulder, while females are 57–64 cm (22–25 in) tall. The head-and-body length is typically between 90 and 190 cm (35 and 75 in). While males weigh 37–90 kg (82–198 lb), females weigh 28–60 kg (62–132 lb); these measurements vary geographically. Leopards, like lions and tigers, tend to be nocturnal (active mainly at night). However, leopards in western African forests have been observed to be largely diurnal and hunt during twilight, when their prey animals are active; activity patterns may even vary by season. Leopards generally are active mainly from dusk till dawn, and rest for most of the day and for some hours at night in thickets, among rocks or over tree branches.